There’s not many restaurants where the draw card is the sauce. However a sauce that Kylie Kwong herself describes as life changing has to be worth a visit. 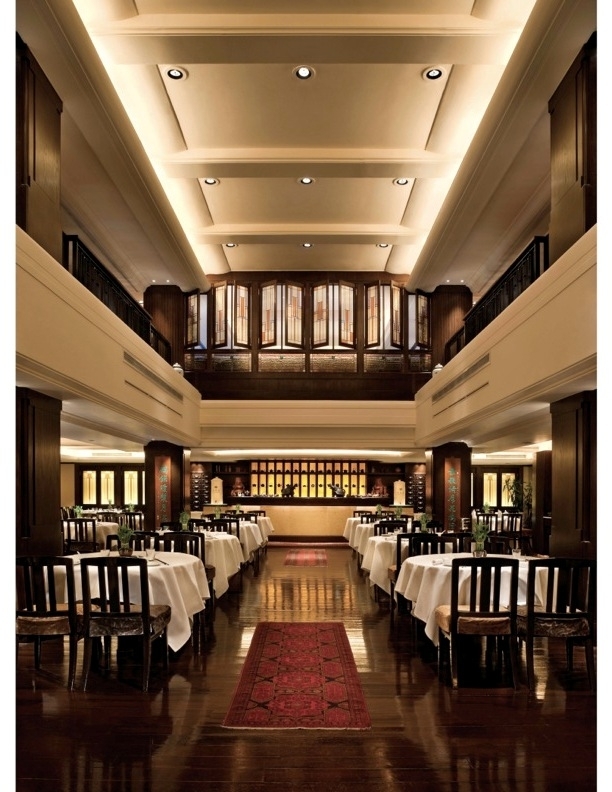 Spring Moon at the Peninsula Hotel is said to have invented the original XO sauce. A fairly recent introduction to Cantonese cooking, the sauce originated in the 1980’s and later took Hong Kong by storm. Often referred to as the “Caviar of the east, it is made up of roughly chopped dried seafood (scallops, shrimp) or Jinhua ham and a spine tingling mix of garlic and chillies. It has a rather umami flavour with a bold, rich and smoky intensity. Unfortunately the famous recipe at Spring Moon is as guarded as the Colonel’s secret spices. So is the XO sauce worth all the hype? I had to find out for myself.. 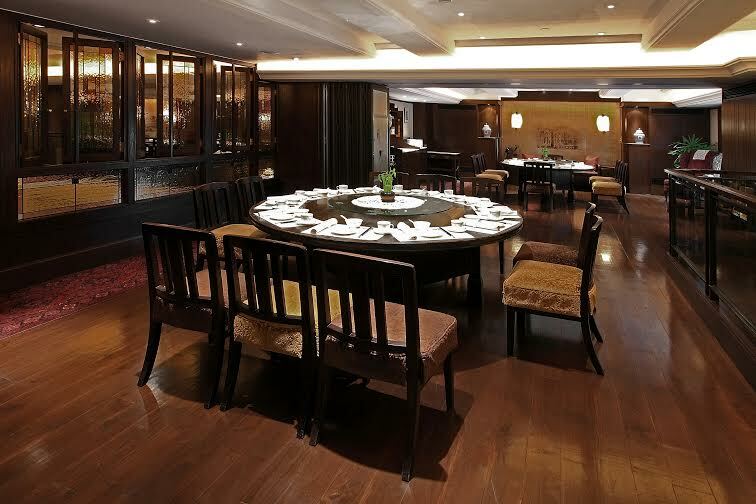 Walk through the stylish lobby at the Peninsula Hotel and take the lift up to Level One and you will enter a peaceful sanctuary of a restaurant that feels like you are eating in your own dining room, despite the 200 plus covers. 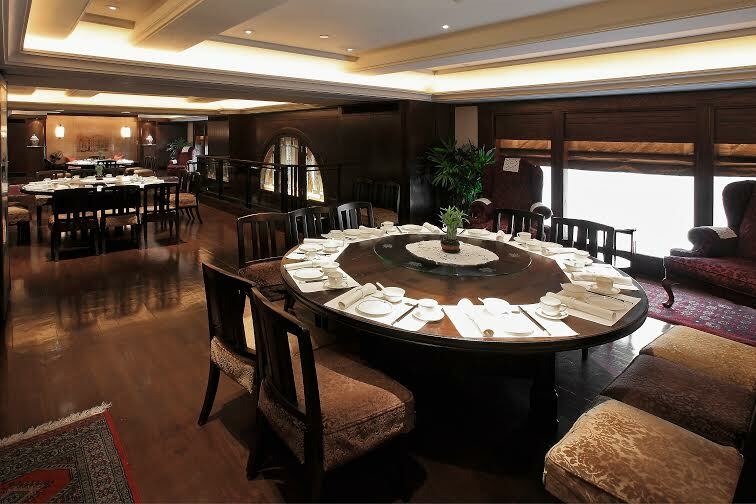 The restaurant is reminiscent of a 1920’s style Shaghai dining room. 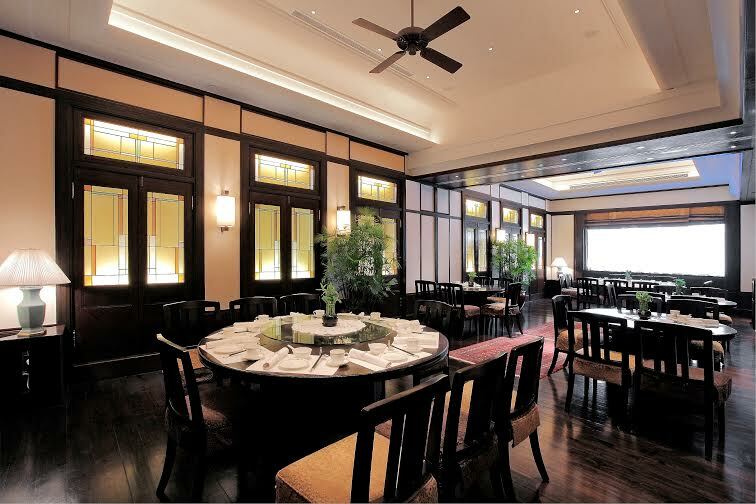 The space has been brilliantly executed with its antique style hardwood floors and touches of Art-deco stained glass. Antique vases line shelves in the walls, accompanied by dimly lit lamps while colourful splashes of oriental rugs upon floors give the restaurant a more homely vibe. But what I liked most about the restaurant, was the feeling of space between us and our neighbours, giving it a heightened sense of intimacy. Waiters circulate eagerly, weaving unobtrusively around fellow diners . Wine and water topped up magically just when we needed it. 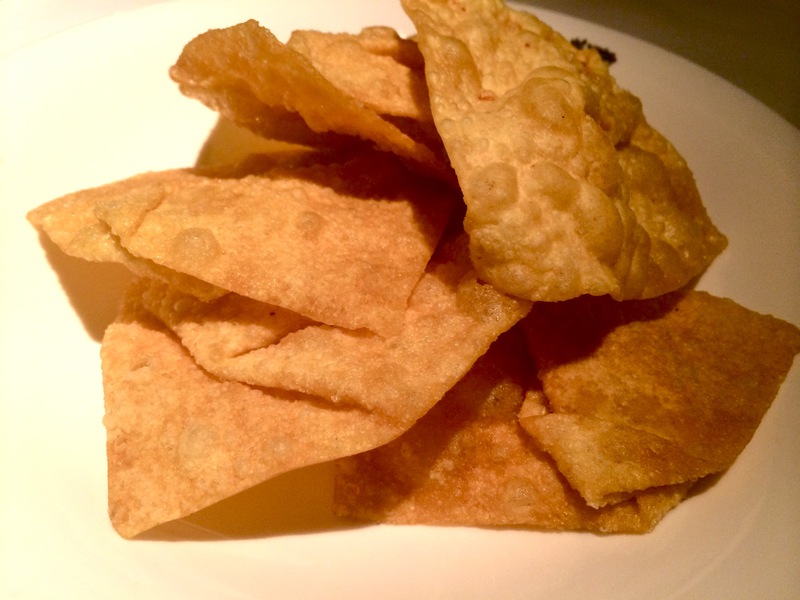 Spring Moon offers Cantonese food at its finest. Dim Sum is a popular option throughout the day, but the a la carte menu by chef Frankie Tang is superb, featuring delicacies like the roast peking duck, Hangzhou beggar fortune chicken and the braised birds nest with crab coral. For tea connoisseurs, there are a whopping two dozen varieties of speciality teas in house which are brewed by Spring Moon’s own expert tea masters. 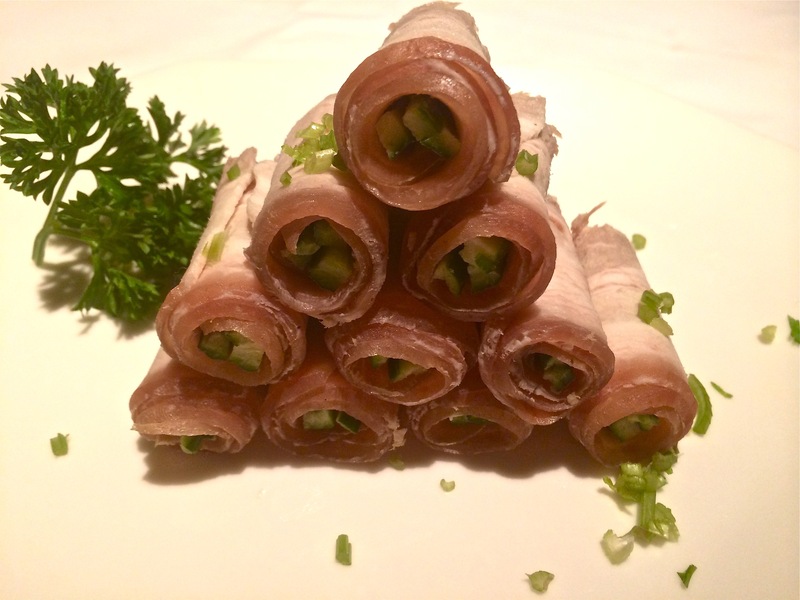 To start, the rolled pork belly – served chilled and neatly assembled in small cigar-shaped cylinders. With a distinct sweet and sour sauce of garlic vinegar, the cucumber in the centre complemented it beautifully with a touch of freshness. 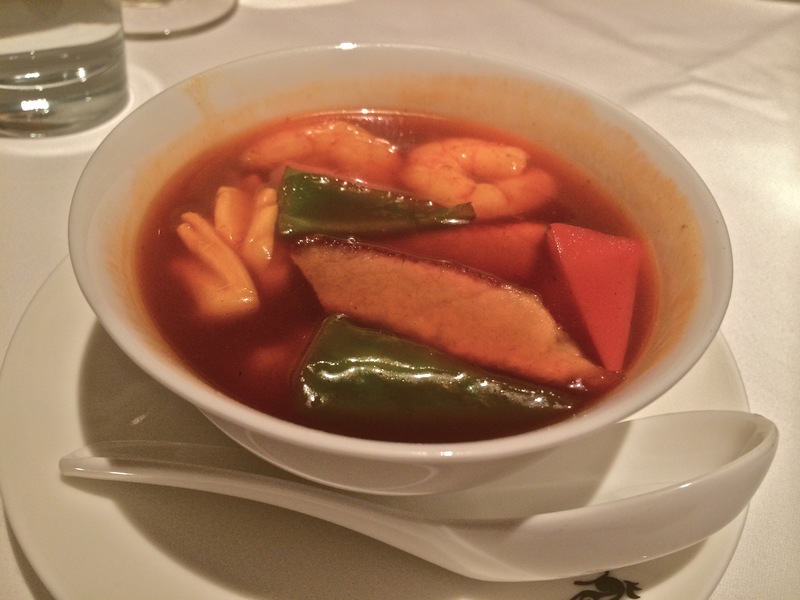 Next came the shrimp dumplings with capsicum and sweet and sour sauce, which was a source of much confusion. Expecting Har Gow with the translucent wrappers, instead we received a sizzling bowl of sweet and sour sauce accompanied by a plate of giant tortilla chips (or so it seemed!). I wasn’t in the mood to argue, the flavours worked surprisingly well together and the giant chips were rather moreish, even stuffed with the shrimps themselves. The hero of the night was without doubt the seared scallops with famed XO sauce. The scallops were beautifully cooked – plump and fleshy as they should be with no sign of toughness. 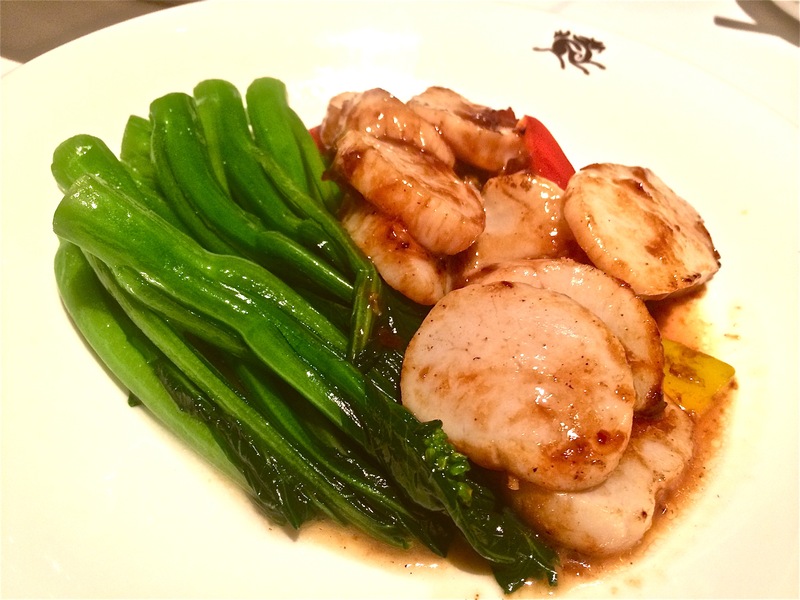 Slightly seared in a wok, the scallops were topped with a golden glaze of Spring Moon’s homemade XO sauce. The XO was nothing short of brilliant, with an intense full-bodied flavour. If it was in a cup I would have drunk it. Next, a sizzling bowl of sautéed chicken with black bean sauce arrived at our already full table. No thick, stodgy black bean sauce here. The chicken, just cooked, had only a hint of black bean sauce, giving it a delicate flavour with an extra layer of intensity from the shallots. 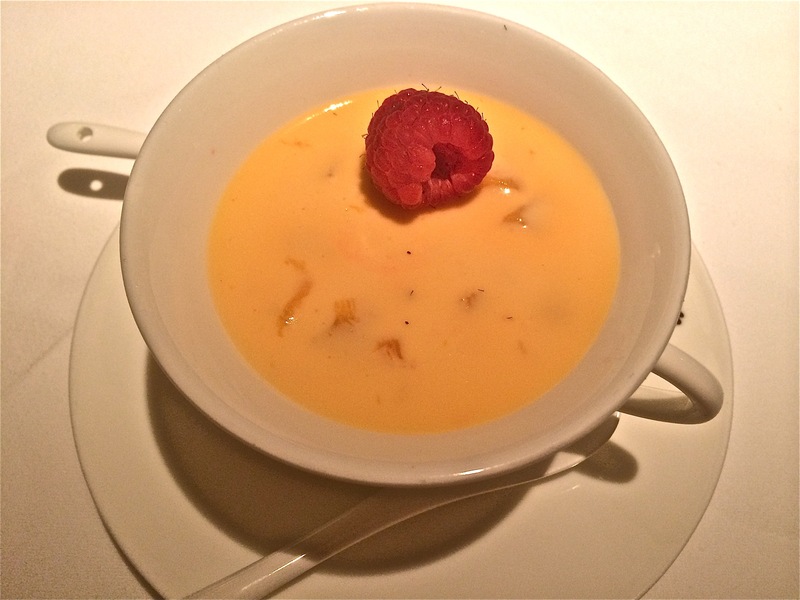 After consulting my dessert stomach, I ordered the waiter’s eager recommendation – the chilled mango pudding. Spring Moon’s signature dessert, was neatly assembled in a dainty white tea-cup. The pudding was beautifully balanced with a perfect mix of sweet and tartness. Little pieces of near frozen mango flesh rippled through the pudding delicately, providing a touch of added texture. A refreshing way to end the night. So is Spring Moon worth a trip for the sauce alone? Hell yes! But it’s a lot more than just the sauce. Approximately 900 HKD per person including wine. Expect to pay more for their specialty dishes.